Japan’s outreach to Russia is risky, as it could end up alienating the United States. On September 1, the Japanese government confirmed an earlier Kremlin announcement that Russian President Vladimir Putin will visit Japan in December of this year. Putin will visit Japanese Prime Minister Shinzo Abe’s hometown, Yamaguchi. On September 2, Abe met with Putin in Vladivostok for a summit meeting. The two leaders reportedly spoke for over three hours, and Abe introduced an “eight point cooperation plan” for Japan-Russia economic cooperation to Putin. Following his meeting with Putin, Abe spoke to the press and said he was able to have a very engaging discussion with Putin, including how to address the Northern Territories issue and the way forward toward a Japan-Russia Peace Treaty. Japan and Russia never formally signed a peace treaty at the end of World War II, largely due to a dispute over the Northern Territories (known in Russia as the Kuril Islands). Although Abe said his government would take a step-by-step approach toward resolving these long-standing issues, he also expressed hope that Japan’s relationship with Russia would enter a new era of cooperation. Following the summit, Abe spoke at the Eastern Economic Forum held in Vladivostok on September 3. He referred to Vladivostok as the gateway which connects Eurasia with the Pacific area. He also expressed his desire for Japan and Russia to sign a peace treaty to end “an anomaly” that has lasted for the last 70 years and build a future-oriented relationship. Abe suggested that Japan and Russia hold an annual summit meeting in Vladivostok at the time of the Eastern Economic Forum. In addition, Abe emphasized that economic cooperation with Japan offers tremendous growth potential for Russian economy. For Japan, its relationship with Russia is the one of major remaining legacies of World War II. Since the Soviet Union unilaterally abandoned a neutrality treaty with Japan in 1945 and declared war against Japan one week before Tokyo’s unconditional surrender, the two countries are still technically at war without a peace treaty. In particular, the Russian occupation of the Northern Territories—the four islands north of Hokkaido whose sovereignty, Japan argues, belong to Japan—has been a reminder to Japan of its defeat in World War II. Indeed, resolution of Northern Territories issue has been considered as a required first step for any Japanese prime minister’s attempt to normalize Japan’s relationship with Russia. Abe clearly sees the normalization of Japan-Russia relations as one of the major diplomatic achievements that he wants to attach his name to. But his outreach to Putin this time has greater strategic significance for Abe beyond his personal desire to leave a lasting mark in postwar Japanese history. From his visit to Washington in 2015 to inviting President Barack Obama to Hiroshima as the first sitting U.S. president to visit the place that symbolizes nuclear destruction, Abe has made critical diplomatic decisions under a larger framework of “moving Japan beyond the postwar regime” (sengo regimu kara no dakkyaku). His decision to engage Putin is consistent with this approach. 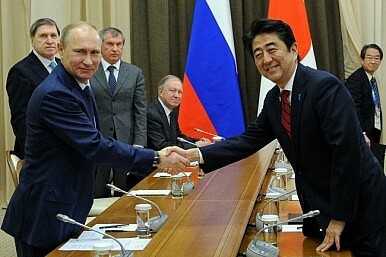 Abe also sees strategic benefit in improving Tokyo’s relationship with Moscow, given the persistent tension with China. In the last several years, China has moved to enhance its security relations with Russia, including increasing joint military exercises. Offering opportunities for economic cooperation to Russia, and thus leveraging Putin’s desire to grow the economy in Russian Far East, could create an element of uncertainty in Beijing’s relationship with Moscow, making it difficult for China to sustain its current intense focus on asserting its position in the East and South China Seas. However, Abe’s move also runs the risk of creating discomfort in Tokyo’s relationship with Washington. The Obama administration has maintained a firm stance toward Russia since its annexation of Crimea, imposing stiff economic sanctions together with its European allies. Engaging Putin at this time, particularly on the economic front, will go directly against U.S. efforts to isolate Russia to pressure Moscow and deter it from resorting to further aggressive behavior. More importantly, engaging Putin’s Russia, which has changed the status quo by force in Crimea, creates weakens the case Japan has been trying to make vis-à-vis China on Beijing’s assertive behavior in the East and South China Seas and contradicts one of the fundamental principles of Abe’s foreign policy—engagement with the United States and other international partners based on shared values. In fact, Moscow announcing Putin’s visit to Japan ahead of the official announcement from the Japanese foreign ministry—unusual in the sense that the host country generally announces such a visit first—no doubt put Abe on defensive vis-à-vis Washington, stripping the option for Tokyo to back away from accepting Putin’s visit. In the months ahead, Tokyo will be required to make a case to Washington as to how Putin’s visit to Japan in December would not compromise U.S. efforts to maintain pressure on Russia against its resorting to further assertive behavior in Europe and elsewhere. It is clear that, by inviting Putin to Japan in December, Abe took a great strategic gamble. Whether it pays off or not remains to be seen.